We went and flew in an airplane and we saw Cayambe Volcano. My Daddy was trying to point out where the climbing hut is and I saw it on the mountain just below the glacier. When we flew over the Amazon all I could see were trees, trees, trees - all nice and green. All those trees make oxygen for us to breathe. After we landed, we went on a bus to the Rio Napo. We traveled on a speed boat to our Flotel and we went downstream from there. The Flotel was big and it had lots of layers on it. There were lots of bugs and butterflies. One looked like a leaf and it fooled me because it was a butterfly! It was a pretty big river. 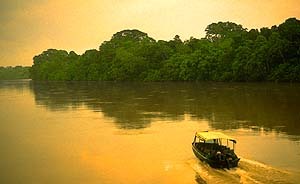 School Notes - Following the Napo River down the eastern slope of the Andes brings you to the steamy tropical lowlands of the Ecuadorian Amazon, known as the Oriente. The rainforests of this region are the most complex biological communities in the world - a small area can boast 500 species of birds, 400 species of fish and over 100 species of mammals.